Just when we thought it couldn't get more exciting - we continued with Week 2 of our Visiting Authors Celebration. Students were immersed in inspiring storytelling and drawing throughout the week. Students loved Matthew's sneak peaks of I'm Scared and I'm Silly. We also got to meet Babymouse as a Middle Schooler in the first volume of the series Tales from the Locker. And, we even got to see a glimpse of the new Squish animated TV series! Matthew drew all kinds of new Babymouse adventures -- she got to eat an ice cream stack as tall as the Burj Khalifa! We were all in snitches with George's story of his real-life encounter with a Greek god. Ask any student in Grades 3-5 to explain how George learned his lesson when he declared, "I'm the son of Poseidon!" Our favorite of George's live drawings included Zeus riding on a triceratops and Poseidon battling against Captain Awesome and Super Turbo! Victoria demonstrated and practiced drawing her famous characters Boomer, G.W., Bea and Astrid with our students. Each group then created an original story featuring an animal using both pictures and words. We had all kinds of stories from a cat who played ultimate frisbee to a bunny who battled a fox. Students turned out in record numbers for our after school workshops. We had more than 60 students join in the fun for each of our three drawing sessions. Students drew some of their favorite characters right alongside some of their favorite authors. Thank you to the parents who joined us for our Talk Tuesday session with our authors. Matthew, George and Victoria shared their views on the value of graphic novels and the importance of visual literacy. Our visiting artists encouraged parents to help their children understand that drawing and writing take practice. They also discussed the importance of developing skills in visual presentation, not just as an author, but across all professions. Most importantly, it is just good fun to read comics aloud with your kids! We have learned so much about comics, story telling, drawing, and reading! Our students and teachers are buzzing with excitement. Students are drawing and writing everywhere they go! Although it is the end of our visiting authors visit, it seems that it is just the beginning of ASD's graphic fever! Keep it up ASD! It has been an honor to host Matthew, George and Victoria. ASD is one lucky school to learn from such talented, passionate and generous artists and authors. Our community has made memories to last a lifetime. In case you weren't sure whether we had visiting authors at ASD or a group of rock stars - let's clear it up. We have rock star authors on campus! The first week was electric! You can feel the excitement, the energy all across the school. It is truly a privilege to Matthew Holm, Victoria Jamieson and George O'Connor at ASD. We kicked off the week with a welcome assembly in the Elementary School. Our student librarians introduced our visitors and showed them some big Falcon pride! Matthew, Victoria and George were thrilled to meet Fadi the Falcon and the camel from Tut, Tut! Each Elementary grade level saw all three authors in the theater this week and several groups began their workshops. Middle and High School students experienced small group visits within their art and language arts classes. Grades 3-5 loved George's dynamic run-through of the Olympians series. We passed the "geek test" by showing our knowledge of Greek mythology! K1, K2 and Grade 1 drew dinosaurs and superheroes with George and helped read Kapow with super loud sound effects. George also led a High School drawing workshop and Comic Con Flex Block encouraging our young artists to draw fast, practice every day and to share their work with each other. Victoria's story telling with K1, K2 and Grade 2 was fun and inspiring. The students wrote and drew stories together and worked on beginning, middle and end. Victoria also shared her process for creating Roller Girl including her writing notebooks and original ink drawings. Middle School Art students got a sneak peek of Victoria's new graphic novel and began to draw comics together. Elementary students loved learning about the creation of Babymouse and Squish with Matthew. Our Grade 4 students were lucky enough to get a preview of the new Babymouse Tales from the Locker series and well as the sequel to Sunny Side Up, Swing It, Sunny. Matthew worked with Middle School and High School Art students explaining his process for planning and creating a graphic novel in collaboration with his sister, Jennifer L. Holm. Please note, that signed books will be delivered to classrooms by March 23. There are a few more books left to purchase or feel free to bring in your copies from home. We can't wait for more exciting learning next week! Calling all readers of our ASD Elementary School community! You are invited to show your participation in our celebration of graphic novels by adding a speech or thought balloon to our window display. Students from K1-5 shared their favorite book, favorite author or an insight about graphic novels in words and pictures. Please stop by the library to view our display! We hope it will offer a warm welcome for Victoria Jamieson, Matthew Holm and George O'Connor when they arrive in our library on Sunday, March 12. The Visiting Authors celebration is a community-wide event and begins in just a few days! Students from K1-Grade 12 will participate in presentations and workshops during the authors’ visit. Elementary students will engage in several grade level sessions with each author, middle school students will learn from the authors during their Language Arts classes and high school students will experience sessions within Art and other specific courses. family participation. Parents, don’t miss the opportunity to engage with your children in these workshops with Victoria Jamieson, George O’Connor and Matthew Holm. 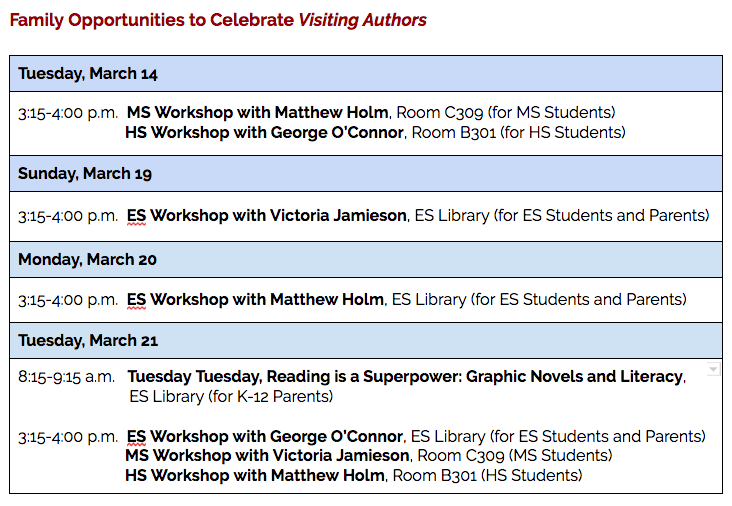 Read the ES Library blog to learn more about the Visiting Authors program at ASD from March 12-23.